Taylor Swift is renowned for her PR skills. She’s sparked numerous spikes in online conversation to launch songs, music videos and build hype around new or upcoming singles and albums, and to build towards her overall brand. Social media is frequently dominated by posts about Taylor’s latest news and this week we witnessed the most recent craze. Since 21 August, Taylor teased fans by sharing cryptic posts on Instagram and Twitter. Fans took to social media to share their thoughts on what the posts might suggest until volumes peaked on Wednesday after Swift confirmed that the first single off her new album would be out before the end of the week. The majority of posts stemmed from the USA, followed by Brazil and then the UK. 3 days after conversation started climbing, she released her latest single Look What You Made Me Do ahead of her new album, Reputation, set to launch in November 2017. 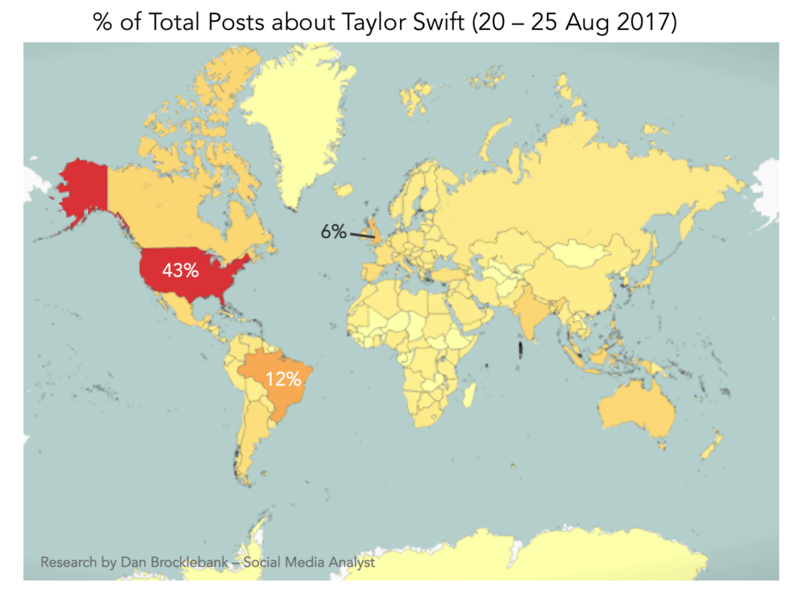 Total mentions of Taylor Swift from 1 January to midday 25 August 2017. 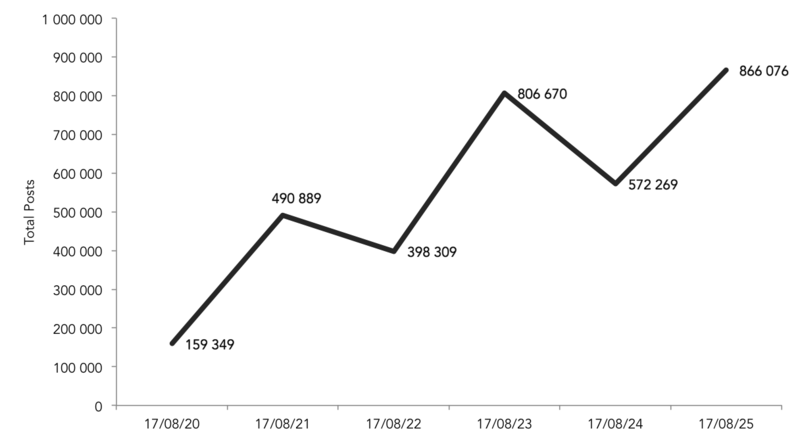 The hype around the new single and album led to a 91% increase in the number of posts about Taylor Swift from July to August. 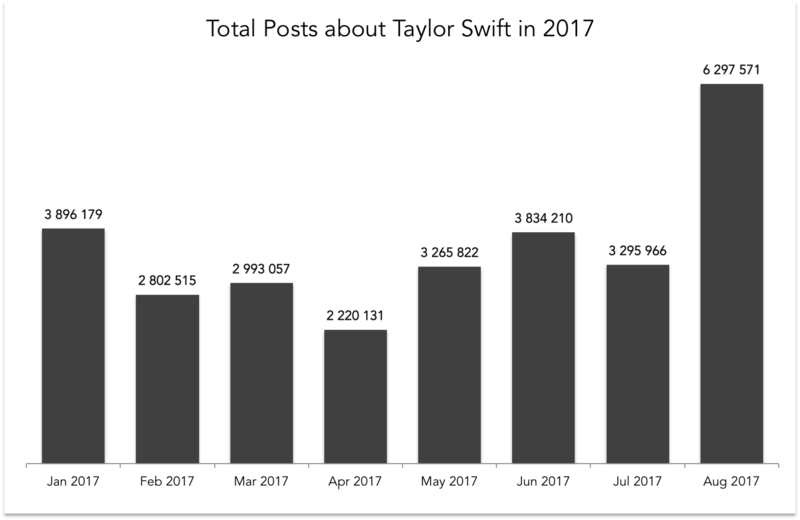 As of 25 August, 22% of the total 28 million posts about the artist in 2017 took place in August. 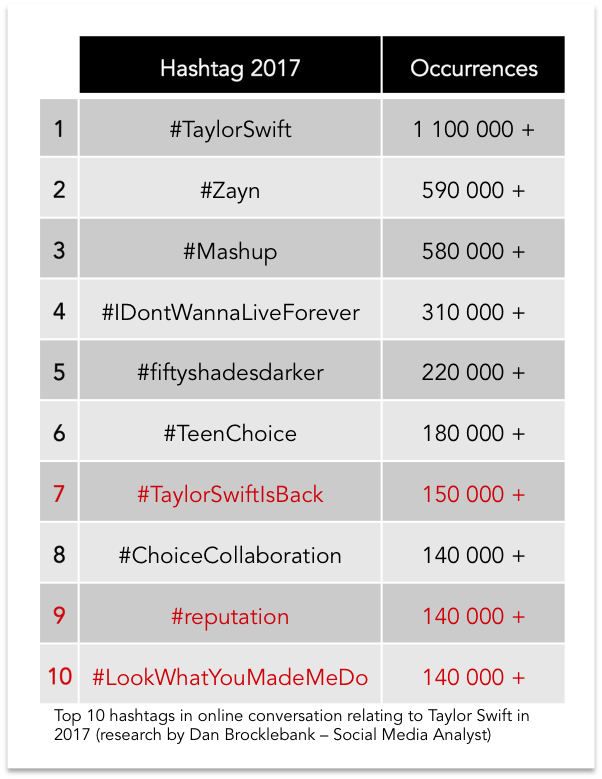 Over a 24-hour period (from 24 to 25 August) #LookWhatYouMadeMeDo was mentioned over 140 000 times and was the 9th most used hashtag in the USA over the period. The most popular hashtag used in relation to Taylor Swift was #TaylorIsBack, started by fans excited for what is to come. Owing to online hype and reactions to the single, 3 of the top hashtags used in relation to Taylor Swift in 2017 have been about the single and upcoming album. This is phenomenal considering the fact that the hashtags have only just surfaced. 25% of posts using the hashtag included images and 14% of posts provided links to articles about the album, the music video on YouTube or music providers that have the single. Taylor Swift is a genius when it comes to sparking conversation and there is no doubt in my mind that this is only the beginning of months of publicity about the album. I think the ‘new Taylor’ is going to be a force to be reckoned with and I’m certain she is going to be more relevant than ever before. Next article Katy Perry Versus Taylor Swift: Who’s Winning?